After the 350 Realm, Boston Whaler just introduced the all-new 380 Realm, a boat designed to empower new adventures and open up new worlds. 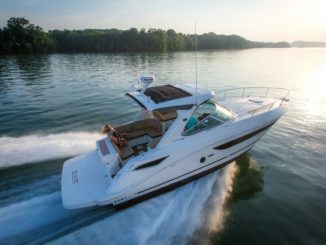 With its spacious center console layout, comfortable modern cabin and impressive performance attributes, the Realm arrives ready for action. Purposeful features make this an ideal entertaining platform, from the versatile open bow with three-across lounge seating; to the two full rows of convertible cockpit seating with a giant under-seat mezzanine cooler; to the robust prep station and extendable SureShade sunshade. A full windshield featuring a brilliantly designed, aft-swinging access door is just one of the Realm’s many feats of engineering. Experience Expedition Grade quality and capability, and travel to the horizon and beyond with confidence! 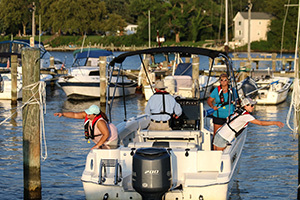 The new Boston Whaler includes a robust cockpit prep center; a massive, refrigerated under-seat cooler; a social open bow and more. 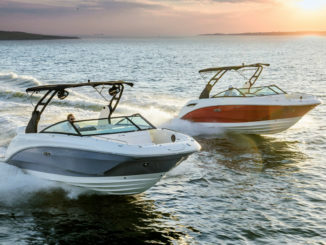 The boat’s spacious center-console layout and brilliant new windshield design provide unobstructed views, while a large integrated hardtop provides tons of shade and protection from the elements — all the way to the horizon and beyond. Advanced Seakeeper gyro-stabilization technology available. The 380 Realm made its debut this month at the Miami International Boat Show.